Without reefs, the U.S. could expect a 91 percent spike in flood damages — an increase of $272 billion — from 100-year storm events. The decimation of the world’s coral reefs could double and triple the cost of coastal flooding and storm damages from the United States to the Philippines, a study published Tuesday in the journal Nature Communications found. The study offers a bleak, expensive — and, for now, hypothetical — window into a world without reefs. These marine ecosystems act as natural barriers to waves, storms and floods, according to the National Oceanic and Atmospheric Administration. But they’re under threat from climate change, pollution, coastal development and overfishing, among other things. Some estimates have found that 90 percent of the world’s coral could be dead by 2050. 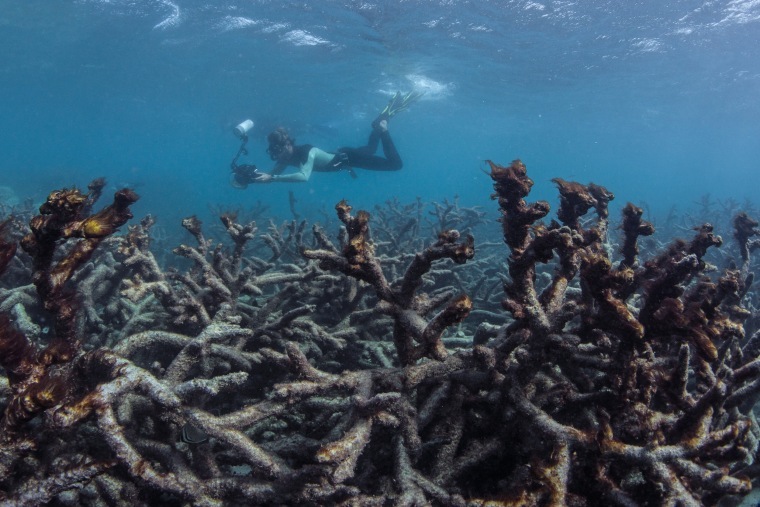 The researchers found that countries hit the hardest by the corals’ demise include Indonesia, the Philippines, Malaysia, Mexico and Cuba, where reefs avert more than $2.5 billion combined in annual flood damages. Small island nations like Grenada, the Bahamas and the Cayman Islands would also see damages from flooding soar, the study says. The United States ranked eighth among these countries, largely because of Puerto Rico, the study found. Without reefs the U.S. could expect a 91 percent spike in flood damages — an increase of $272 billion — from 100-year storm events. Though reefs can be critical to ecosystems, the researchers say, government officials and others rarely consider them in coastal management plans. “These services are not quantified in terms familiar to decision-makers,” the study says. Despite the dire outlook, the researchers say that investments in management and restoration could go a long way toward stemming the reefs' many threats. “The effects are not foregone conclusions,” the study says. CORRECTION (June 13, 2018, 12 p.m. ET): An earlier version of this article misstated the study's publication date. The study was released Tuesday, not Monday.